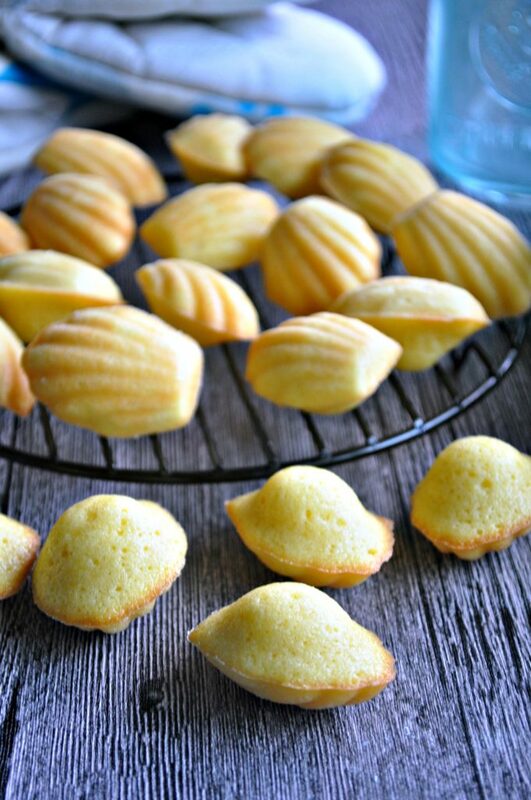 I always thought that the madeleines are a kind of “鸡蛋糕 ji dan gao”, simply prepare the batter and bake off. Doesn’t really have to bother about its shape or whatsoever, as long as It turns out nice, puffy and soft. 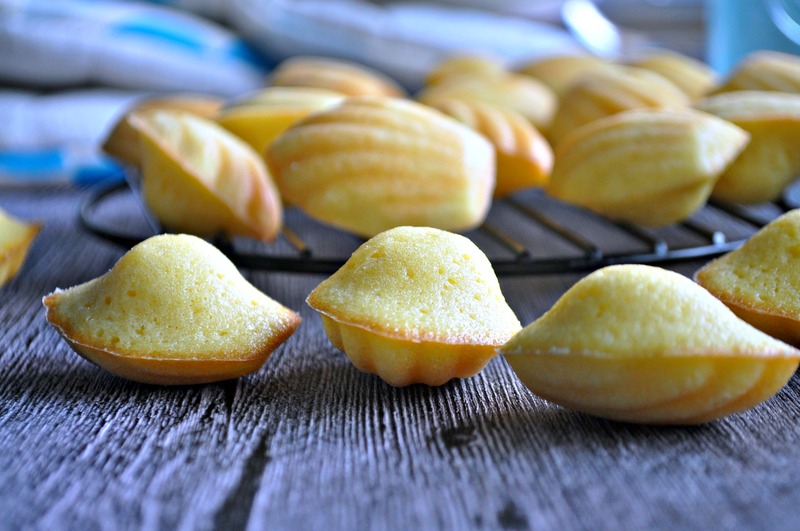 But I was browsing through for some recipes when I read that madeleines are actually a kind of French desserts that though tasted very similar to our “鸡蛋糕 ji dan gao” (in my opinion), but the very distinctive difference between the both, is the signature “hump” that’s found on one side of the madeleines. Gosh, so I have always been assuming and making madeleines the wrong way !! LOLs. Okok, so I have to rectify it. In fact, I prepared the madeleines 3 times in a day to determine how to achieve that very pretty dome that’s humped up perfectly. The conclusion of it all lies in the length of time in which the batter is allowed to be chilled and how cold the madeleines pan is when it is being used for baking. 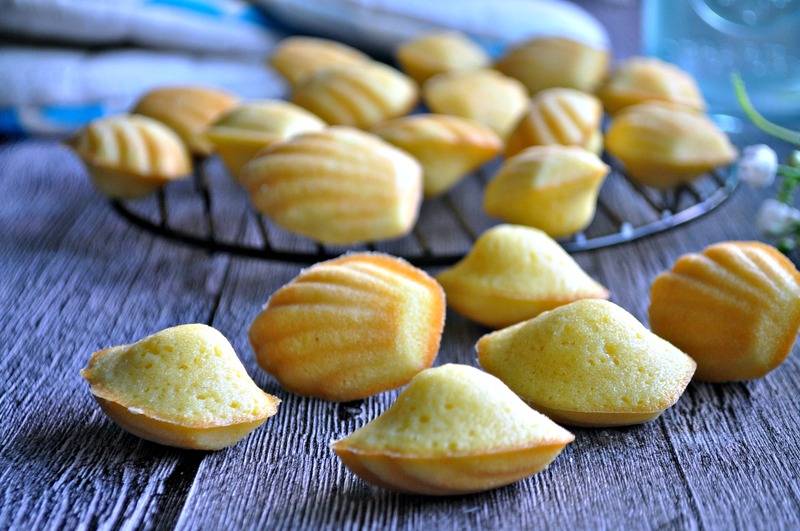 As you know, madeleines come in very petite sizes. And that somehow gave me the impression that it should be something relatively fast to prepare. Though I knew the batter had to be chilled, my initial thoughts was that one hour or so chilling time should be good enough as long as it is cold to touch. So on my first attempt, I used a batter that was chilled for an hour. There were some domes for sure but strange enough, it wasn’t for all in the same pan ! My 2nd attempt was done on both a batter and pan that’s chilled for half an hour. Needless to say, not only were they missing domes, it somehow also took a longer than usual time to be cooked. And on my last attempt, I had the batter chilled for 4 hours and the pan in the freezer this time for the same amount of time ! And guess what ?? The perfect hump was bustling up high and it stayed its shape throughout !! The colour of the madeleines were equally perfect as well, with a golden brown hue all along the edges of it !! All these are the so-called signature iconic features of the classic French dessert. And as compared to the first try, the dome was many times more distinctive and the colour and texture wise were all notably better. 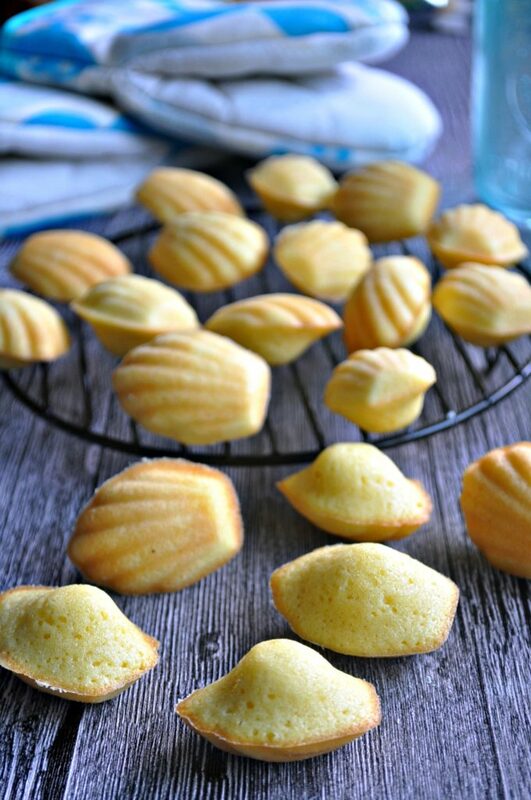 What I have used is a MINI madeleines pan that can be used to make 20 pcs at one go. It’s really a bite-sized thing and can easily be finished up with one mouthful. And baking time was an approximately 7 minutes only. Fast to bake but even quicker to gobble up !! Now that I knew the trick to doing it, I had to tell myself to stay patient whilst waiting for the stuffs to be chilled. Perhaps I should just prepare everything overnight the next time to drain away the waiting time !! And since the festive is around the corner, what’s better than not to prepare these fast baking and delicate tea cakes for the party menu. Enjoy !! In the bowl of your electric mixer, beat the eggs, sugars and vanilla extract at high speed until the mixture is thick and pale in color about 5 to 6 minutes. Then sift about one-third of the flour mixture over the whipped eggs and gently fold in, using a rubber spatula or whisk. Sift and fold in half of the remaining flour, and then sift and fold in the rest. (Do not over mix or the batter will deflate). With a spatula, gently fold the butter mixture completely into the egg batter. Cover and refrigerate the batter for at least 4 hours, preferably overnight. Using a pastry brush, generously grease the molds of the madeleine pan with melted butter or oil spray. Then dust the molds with flour, tapping out the excess flour. Refrigerate the pan in the freezer for as long as the batter is chilled. Drop a generous tablespoonful (can use an ice cream scoop) of the batter into the center of each prepared mould. Do not take too long to manage this as the batter and pan has to stay cold before going into the oven. 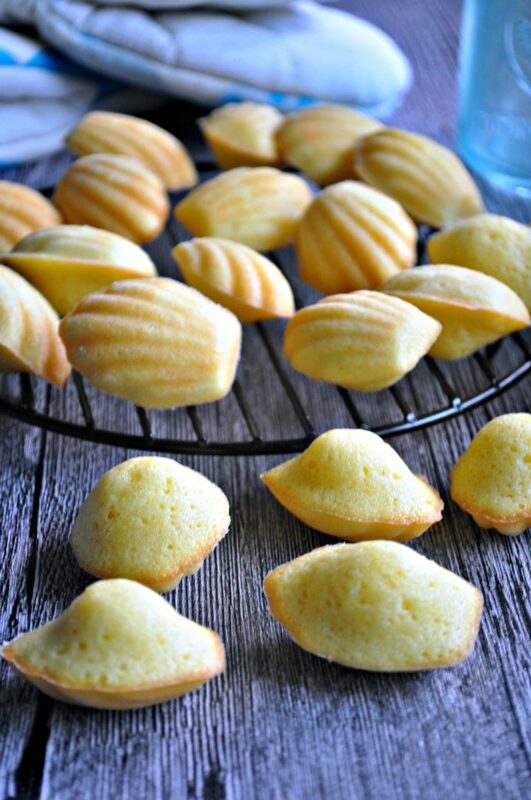 Place the pan into a pre-heated oven of 185 degrees C and bake the madeleines for approximately 7 minutes (for mini size madeleines) or 10 to 11 minutes (for normal size) or until the edges are golden brown and centre spring back when lightly touched. Flip the pan over and tap out the madeleines. Allow them to be cooled slightly before serving. 1) The timing to microwave the butter is an estimate. To prevent the butter from splashing all over when melting, do it at intervals and use a microwavable cover to cover the bowl when heating. 2) The longer the batter is kept chilled and the pan is being kept cold, the more distinctive the "hump" will appear to be during baking. 3) Depending on individual's preferences, you may want to bake this slightly longer than the stipulated timing if you prefer a drier and crispy texture. 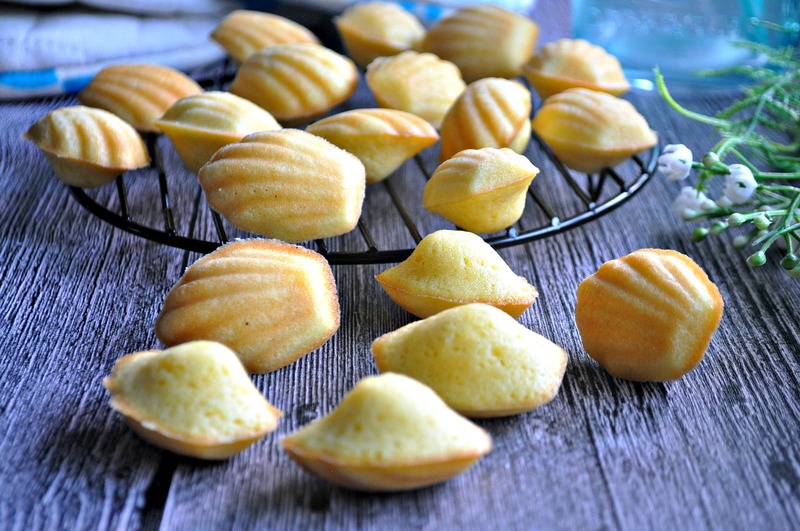 4) These madeleines are ideally to be eaten on its own or served with a dust of icing sugar.